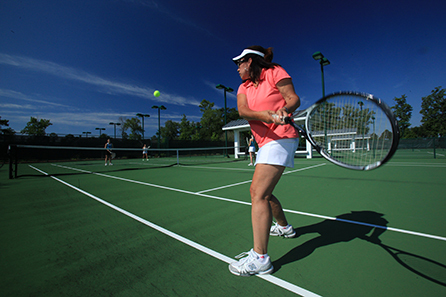 With gorgeous Spring weather abounding, it’s the perfect time to hit the tennis courts and warm up your strokes! Join the Brunswick Forest Tennis Program and get back in the game! From USTA tournaments and clinics to drop-in practices and community events, play your way as you meet fellow Brunswick Forest residents and tennis enthusiasts! As the head instructor for Brunswick Forest Tennis, Jeff Kohl offers clinics for all levels of play at the Fitness and Wellness Center tennis courts. Learn the basics of the game from scoring to court positioning, as well as more advanced shots using top-spin and under-spin. Jeff also teaches a variety of singles and doubles drills that will keep you moving and help you improve your game! Tennis is just one of the many ways that you can get involved at Brunswick Forest. With group fitness classes at the Fitness and Wellness Center, available tee times and lessons at Cape Fear National Golf Course, and over 100 miles of walking and biking trails throughout our gorgeous community, staying active has never been easier! Take a look at the large variety of activities and amenities available here in Brunswick Forest!